HomeBlogHave you considered localizing your content? As per the definition found in the Business Dictionary, localization is “the practice of adjusting a product’s functional properties and characteristics to accommodate the language, cultural, political and legal differences of a foreign market or country.” In other words, localization goes beyond translation as it modifies the source content and adapts it in order to be meaningful to the target audience, e.g. by replacing the date and time formats, including business etiquette or values, or choosing more appropriate graphic elements. 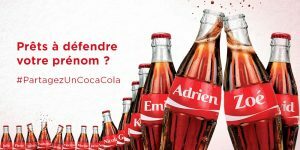 An example of a successful localized campaign is “Share a Coke” from Coca-Cola, where labels have been updated with first names or words relevant to each country. Indeed, it is important to keep in mind that only 25% of daily internet users worldwide are English native speakers – Internet World Stats 2017. 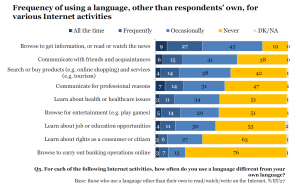 Even if English is the most frequently used foreign language in the EU, 42% of internet users said they would never buy products if the descriptions are not in their language – European Commission survey. Worldwide, 72% of customers are more likely to buy a product if the information is displayed in their own language – Common Sense Advisory. 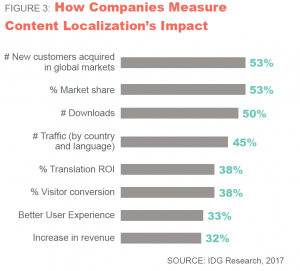 What are the benefits of localizing your content? Not only will localizing your website or marketing materials show your customers that you respect them, it will also improve their user experience. Customers will be more likely to spend more time on your website and to buy your products. In addition, conversing with your followers in their native language on social media or other communication channels could also increase their engagement and lead to more sales. Considering that the majority of internet users/customers worldwide are not English native speakers, localizing your content also lowers the risk of being misunderstood and most importantly of offending potential customers – while a marketing campaign can seem amusing in your country, it could deeply offend people from a different cultural or religious background. And you, will you localize your content? Based on the Smartling survey, 94% of multinational companies plan to increase their localization spending in 2018. In order to keep up with competition, it seems that most businesses will have to consider the importance of localizing their content in the coming years. You have probably heard about translation fails that have durably hurt the credibility of renowned brands, affected their sales, and cost millions of dollars to correct the mistakes – “Slave jewelry” from Mango in France, “Turn it Loose” from Coors in Spain, “Pepsi brings you back to life” in China, just to name just a few. Ensuring that the target content is of excellent quality. It is therefore better to entrust the localization job to a qualified translator, whether internally or externally. Would you say that localization is also important for your business or organization?